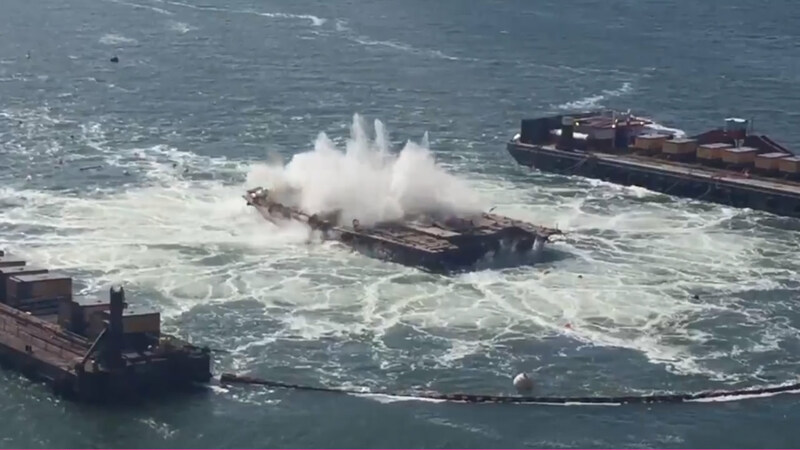 SAN FRANCISCO (KGO) -- Caltrans continued with the removal of the original eastern span of the San Francisco-Oakland Bay Bridge today by imploding Pier E4 of the Old Bay Bridge. Pier E4's implosion too less than five seconds, using approximately 12,000 pounds of explosives. Two weeks ago, Pier E5 was imploded with 8,000 pounds of explosives and done in less than three seconds. Caltrans says this method reduces the environmental impact and costs to taxpayers. Significant environmental monitoring will take place throughout the process, including water quality, sonar, marine mammal and fish Caltrans assured. Caltrans says October provides the window when the least possible number of fish and marine mammals are present in the area. A Blast Attenuation System, better known as the "bubble curtain," will minimize impacts to biological resources in the Bay on each foundation-blasting project - as explained by Caltrans. Last November, Caltrans successfully removed the 50 million pound Pier E3, the largest of the marine foundations. Beginning with the implosion of Piers E4 and E5 this month, there will be three consecutive blasting seasons over the next two years. Caltrans will demolish Piers E6 through E11 in fall 2017, and Piers E12 through E18 will be removed in late 2018, when the demolition project is scheduled for completion.